I’ve been going back to Second Life a lot lately. For one thing, I just miss it. I still keep my premium membership. I tell myself it’s so I can use it as an office and meeting space, but really, I just like having a foothold there. Second Life is the “stickiest” of all the virtual worlds I visit. When I got to my office yesterday, I found myself rearranging the pillows on the couch. For five minutes. There’s no virtual place I have seen where that kind of activity is so easy and so natural. In no other virtual world can students learn so quickly to create things. Granted, those things are pretty clunky, but if you think of them as art, what students create can be pretty great. When you see virtual creations as art, you understand that reproducing an idea is not always the best way of presenting it. An exact copy would kill the magic. Ask Picasso. Artistic creation also helps us be better teachers. I remember Hypatia Pickens’ extraordinary video on a poem from the 14th century Confessio Amantis of John Gower. The video was made five years ago, when the platform was much less sophisticated, but it’s still stunning; I would certainly use it if I were teaching Gower. It’s a good example of how clunky things can be used to provoke a deep response from the student, while at the same time achieving educational goals. Watch the video, and you will never feel the same about Middle English rhyme and meter, and although it’s a video, it does give you an impression of what it would be like to experience it in a virtual world. I was thinking of Hypatia’s video while listening to a recent talk at the Nonprofit Commons in Second Life by Dr Mary Stockrocki of Arizona State (Marylou Goldrosen in SL). Marylou has taught in Second Life for over ten years, and now teaches at NPC in her Art Ark and Sky School builds. She owns a collection of Kilim rugs, and uses versions if these in her virtual classroom. Students learn to perform critical appraisal of these cultural artefacts by close examination, and by interacting with them as furnishings, comfort zones, art. 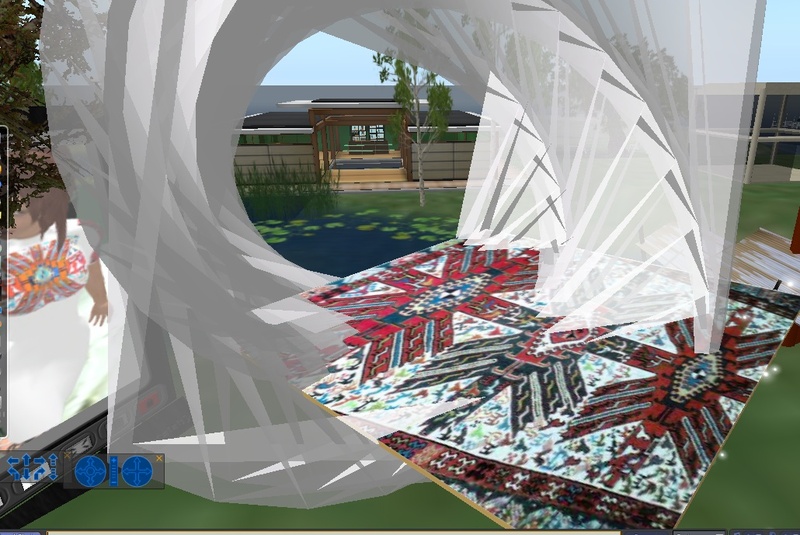 Students can also pick up cultural cues from the rugs themselves, and link them to manifestations of that culture within Second Life. This is a kind of teaching that I am particularly fond of, an opportunistic use of “what’s there.” Although it’s not what it once was, Second Life still has many strong communities, and these have much to offer our students. Marylou also teaches digital ethnography, and I’ll be talking about that in a later post. If you’re interested in teaching in SL, I recommend the NPC talks. It’s a nice community of friendly, helpful, and knowledgeable people. You can follow them on Facebook to keep up with their schedule, or you can just join the group within SL and receive their notifications. Previous Previous post: An alternative to VW teaching?